The Jay Godfrey brand hails from New York and has an aesthetic that personifies that lively and buzzing city. Since it was first established the brand has taken its love for the Big Apple and given it an extra injection of global glamour to make it a must-have label for Glamazons all-over the world. Designs are for women who love trend driven looks, who appreciate the fashion-forward and who are hungry for clothing that is as unique as they are 'it's the perfect brand to make a statement with wherever in the world you are. 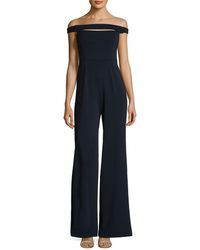 Shop the range of jumpsuits from Jay Godfrey for full-length cut-out back jump suits, jumpsuits with cut-out detail and styles in bright bold shades, from purple to hot pink.